The Annotation tool lets you add text to the floor plan or 2D Elevation view. To add text, activate the Annotation tool, draw a text box, and then type or paste text. To activate the tool, choose Insert > Text Annotation. 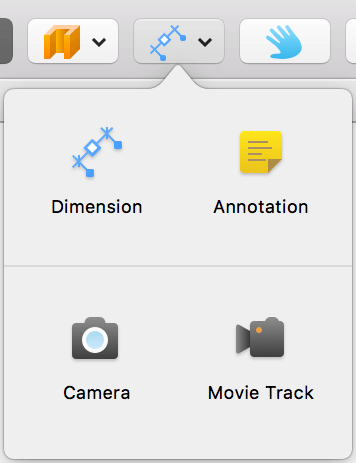 You can also select the Annotation tool in the Auxiliaries tool set. This tool shares a button in the tool bar with other tools. Click the button and hold it to display all of the tools. To edit text, double-click on it. Text formatting tools are located in the 2D Properties tab of the Inspector. The font size will remain the same if you choose another scale in the Project Settings dialog. To resize or rotate a text box, move the corresponding handle on the object's frame. Text boxes added to the project are listed in the Project Tree. In the Project Tree, you can lock text or make it invisible.